Ace Power, a subsidiary of Aitken Spence is looking at setting up power plants in Bangladesh and Indonesia. “We are looking at setting up a 150 megawatt power plant in Bangladesh,” Assistant Vice President (Operations) Aitken Spence Power, Roshan De Seram said. The company has forwarded proposals to Indonesia and Bangladesh and they are expecting a positive response. Ace Power is currently supplying power from their plants in Embilipitiya, (100 megawatts) Horana (20 megawatts) and Matara (20 megawatts) to the National Grid. “We are also looking at opportunities in Sri Lanka especially in the North-East,” he said. The investment for the Embilipitiya power plant is Rs 8 billion. Meanwhile the cost of transporting the Heavy Furnace Oil (HFO) one of the biggest overheads is expected to be drastically reduced once the Ruhunu Magampura Port oil bunkering facilities is operational. “We need 550 tonnes of HFO daily to keep the plant operational and there is a fleet of fuel carriers plying between Colombo and Embilipitiya causing heavy transport costs, delays due to traffic and various other problems and hardships to other road users. Once the oil bunkering facilities at the Ruhunu Magampura port are operational, our transport costs will be drastically reduced giving the company a 30 percent saving as the port is only 70 kilometres from Embilipitiya. This will be passed on to the people, benefiting them immensely,” Ace Power Embilipitiya Administration Manager R Annesley Rebeira said. According to Ace Power Embilipitiya Maintenance Manager T K De Costa, the emission control system in operation at the power plant is 99.5 percent effective. “We keep the plant under constant emission level monitoring and every three months the plant is issued a certificate by the MBRO,” De Costa said. The plant is situated on a 44 acres of land on a 33-year lease on the Middeniya Road, Embilipitiya. It uses 14 generators manufactured by Caterpillar. 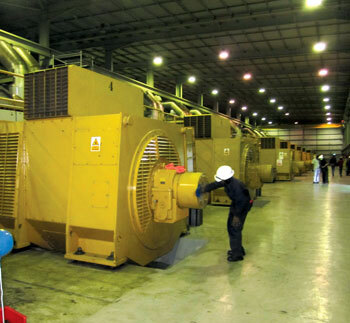 “The total HFO consumption per day for all 14 generators is 550 tonnes. We have obtained ISO 9001 and have applied for ISO 50001:2011,” De Costa said. “The power we generate here at Embilipitiya is released to the National Grid as per their requirements. The demand for diesel electricity is reduced in times of heavy rain and then we have to turn some generators off to control the supply. But, as the capabilities of the Embilipitiya Receiving Station are limited, we are somewhat hindered in supplying our full output to the National Grid,” Ace Power Electrical Manager Malkosh Wanigasekera said. Ace Power is also making a huge contribution to environmental conservation.